Apart from for 1999, which is specifically mentioned in one of Nostradamus’ quatrains, there is nothing he had to say which can be specifically attributed to 2016. Moreover, not only did the King of Terror he foresaw for the seventh month of 1999 not appear, but there was no event at that time which came anywhere near to his prediction. So the coming of WW III or of the next anti-Christ or a new invasion of Europe from the Asian steppes in 2016, as many of the Nostradamus brigade are now predicting, are not actually with any foundation. And even if they were, Nostradamus interpretations have a remarkably poor record in forecasts (but a very good record for hindcasts). Before and after Mars to reign by good luck. Depending upon calendar, the seventh month refers to July or September. During that period NATO was conducting a local air-war in Serbia and the Russians were battling rebels in Chechnya. But there was little else to match a King of Terror or a new King of the Mongols. But I do see a high probability of a natural catastrophe during 2016. The last 25 years have been a remarkably quiet time for major volcanic eruptions. But 2016 may well see a major VEI 5+ volcano eruption, which is now very long overdue. The Puyehue-Cordón Caulle eruption of 2012 is sometimes stated to be of strength VEI 5, but it seems more likely it was no more than a VEI 4. The last VEI 5+ eruptions were in 1991 (Mt. Pinatubo and Mt. Hudson) and that is 25 years ago. Through the 20th century, VEI 5+ eruptions occurred on an average every 7 years (max gap 23 years) and every 11 years during the 19th century. So for 2016, there is a high probability of a major volcanic eruption. Of course, the Ring of Fire is where this is most likely to occur. But my hunch is that the next major eruption could be in the Northern hemisphere. In which case the Mediterranean or Iceland come into the picture. I note in passing that the earth’s magnetic field continues to weaken and the poles continue to drift. It is not inconceivable that another rapid magnetic reversal event such as the Laschamp event is currently underway. Reversal of the geomagnetic field occur regularly, but slowly, over geologic time periods. The Laschamp event however occurred very rapidly with the magnetic North Pole drifting to the Antarctic and back again over some 500 years. Phys.org: 41,000 years ago, a complete and rapid reversal of the geomagnetic field occured. ……. What is remarkable is the speed of the reversal: “The field geometry of reversed polarity, with field lines pointing into the opposite direction when compared to today’s configuration, lasted for only about 440 years, and it was associated with a field strength that was only one quarter of today’s field,” explains Norbert Nowaczyk. “The actual polarity changes lasted only 250 years. 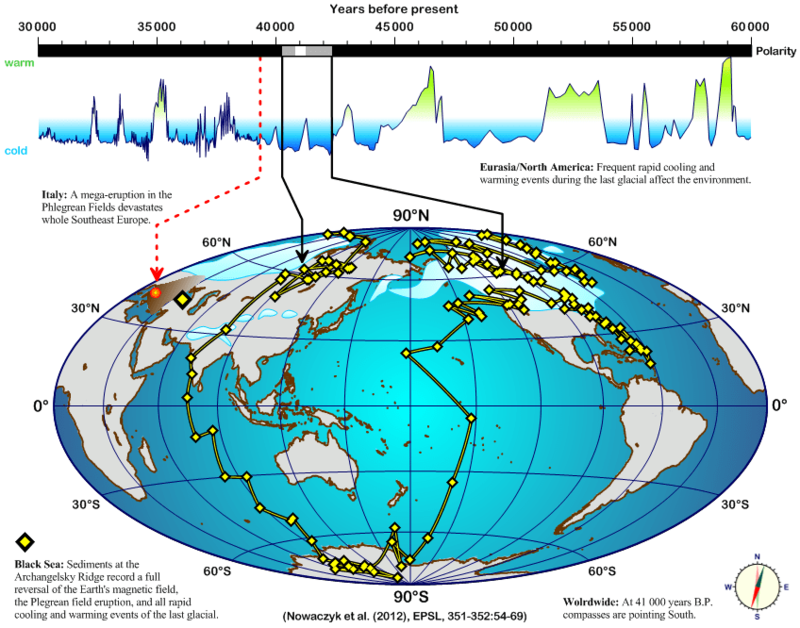 In terms of geological time scales, that is very fast.” During this period, the field was even weaker, with only 5% of today’s field strength. As a consequence, the Earth nearly completely lost its protection shield against hard cosmic rays, leading to a significantly increased radiation exposure. Two other events of note occurred simultaneously – though that may just be coincidence. Forty thousand years ago is close to the time when the Neanderthals disappeared as a separate species and continued only as those absorbed within modern humans. It was also the time when the supervolcano (VEI 7+) erupted 39400 years ago in the area of today’s Phlegraean Fields (Campi Flegrei) near Naples. It was the largest volcanic eruption on the Northern hemisphere in the past 100 000 years. The magnetic poles are already a long way away from the geographic poles. The South magnetic pole in particular is already outside the polar circle. NOAA: The most recent survey determined that the Pole is moving approximately north-northwest at 55 km per year. Currently, in 2015 the location of the north magnetic pole is 86.27°N and 159.18°W and the south magnetic pole is 64.26°S and 136.59°E. Pole reversal is not a catastrophic event in itself. Even with a weak magnetic field, the atmosphere provides good protection against radiation and the effects would probably not be catastrophic. But the indirect effects of changing flow patterns in the earth’s core (which might be the cause of geomagnetic reversal), on tectonics, volcanic activity and climate may be much more profound. My gut tells me that that the releases of energy which accompany major earthquakes and volcanic eruptions can only be explained by the flow patterns in the earth’s core which power the movement of the tectonic plates – and also control the earth’s magnetic field. If last year the probability of a VEI 5+ eruption was said to be 95% over the next 5 years, then the chances of a major eruption in 2016 are now quite high. This entry was posted on December 31, 2015 at 8:41 am and is filed under Geosciences, Natural Disasters, Natural Phenomena, Volcanos. You can follow any responses to this entry through the RSS 2.0 feed. Both comments and pings are currently closed. When you’re interested in this subject, there is a must-read book about it: Magnetic Reversals & Evolutionary Leaps, by Robert W. Felix. See his website iceagenow.info. Highly recomended. (I have no interest in sales of this book).